Sutter Delta Labor and Delivery nurse Amy Aris never expected to retire and end her 42-year nursing career this way. 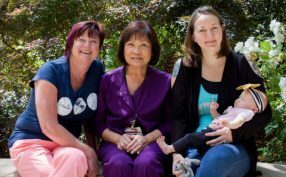 Twenty-seven years ago, she and Dr. Scott Wada helped deliver the daughter of their colleague, Sutter Delta lead phlebotomist Laura Foster. That baby, named Kayla, grew up, graduated college and got married, and chose to start a family herself. Perhaps you can guess what comes next. Kayla, now all grown up, decided to have her baby delivered at Sutter Delta, where her mom had had her children and still worked, 39 years later. But wouldn’t you know it – the team that was there when Kayla was ready to give birth was none other than . . . Dr. Wada and Amy Aris. They delivered a healthy baby girl, named Madison Evelyn.